Just look out your window in June and July. If you live in the US, the sun should never rise or set north of the tropic of cancer which is in Mid Mexico, which is the farthest north the sun should be on the longest day June 21st; the summer solstice. Check the sunrise and sunset at the moment the sun touches the flat horizon (mountainous terrain skewers the results). If you live north of Mexico and the sun is north of you, use your common sense. You know this is wrong. Ignore the phony data & attempts by authorities using every asset to make you question what you see… but they cannot hide the sun from you unless you allow them to convince you that you are wrong. Look at the position of the sun in mid June with your own eyes. Everyone knows the sun should never be north of the tropic of Cancer or south of the tropic of Capricorn. But it is now @1200 miles farther north in summer and the same amount farther south in the winter. This is why we are having hotter summers and colder winters. Tsunami’s are caused by the movement of the earth. Not Earthquakes. Look out your own north facing windows. Everyone who is over 40 has been around long enough to know that the sun has never shown into the windows facing due north. Now we have the sunrise and sunsets glaring into these north windows for the first time ever. It was first noticed in June 2005 after the big axis shift which created the Indonesian Tsunami which killed over a quarter million people. New Zealand, Chili and Japan Tsunami’s were additional subsequent Tsunamis & documented shifts of the earth’s axis. These shifts & Tsunamis will continue to occur as we lose the south pole anchor point (which maintains our planetary balance) from the melting of land-based ice. Interestingly, most of the shifts occur during the winter months which is summer for the south pole which maintains the balance of our axis as an anchor point. Clearly, the sun has been rising and setting to the north of the southern US states which can be seen at its northern most point on the summer solstice June 21st but you can still see it at least a month before and after that date. Having a home which faces directly north and is perfectly aligned east and west… the sun never, ever shined in the windows on the north side until just a few years ago. I designed my window glass tint, polarization & shades on the north side based on the absence of direct sunlight. One day in the summer of 2005, the sun was shinning in my eyes for the first time through the north windows at sunset and had to rearrange the furniture because of it. Even the neighbors noticed it from their own homes. More and more people are beginning to notice it and every effort is being made by our authorities to alter data on the internet to make you believe this is normal because the gov’t does not want the backlash of the public for allowing the conditions to continue which are escalating the melting of the ice. It is too late to stop it. It will continue until the earth slips onto its side at the Equator with the poles horizontal. The planet will not invert upside down because there is not enough land or land ice weight at the north pole to tip the planet upside down. The equator is the heaviest point with the largest circumference. According to some scientists, this has happened 11 times in the past. It probably explained why the cradle of civilization was in the equatorial region. The rate of the axis slippage is directly related to the rate of the melting land based ice on the south pole. At some point, probably between 48 and 52 degree tilt, the Earth will reach the tipping point and likely slip the rest of the way onto its side. The authorities only need you to believe there is nothing wrong, long enough for them to be safe in their nice underground facility in Denver built by our Taxpayer money, while they leave the public empty handed. The scientists & agencies all depend on the gov’t for their jobs & income through DOD contracts, research, grant monies, grants to universities, security clearances, aerospace, Observatories, retirements, etc. Even international scientists are controlled by US gov’t foreign aid & corporate loans to their countries. So don’t expect any of them to challenge the US governments official stance on any issue. For those who don’t know, the sun is supposed to be directly over the Tropic of Cancer on the Summer Solstice June 21st. That is its farthest north position of the sun directly overhead. The Tropic of Cancer is near central Mexico. The sun has NEVER been any farther north until now. (Although there are reports of 11 instances of the Earth tipping over onto its side). We should never see the sun rising and setting to the north of the Texas north border… but it is. Let the pitbulls and gov’t paid jackals rant all they want to cover it up or explain it away. JUST LOOK OUT YOUR WINDOW. If you live north of Mexico, then the sun should never be rising or setting to the north. It should never be farther north than the Tropic of cancer which runs through mid Mexico. A couple people have made comments about the darkness and light levels in Canada. I have friends in Nova Scotia and Alaska. Both of them, who do not know each other, have told me about the changes to their weather & how the four hours of dim twilight in the summer are now perfectly light as day. So anyone who says Canada is unaffected is likely someone who isn’t old enough to remember how it was. We have also heard from people in the UK who tell us the same. I’ve been there myself. The change in the sun is most noticeable by those of us who are old enough to remember how it was prior to 2000 and the decades before. If you are under 35 or 40, it is unlikely you have been around long enough to realize the difference. Be aware of that before taking advice on this issue from someone else who has not been around long enough to have seen the differences. You can see images and official data and links to official gov’t sites on http://divulgence.net/ as well as how the gov’t & NASA and the world scientists covered up a major shift of the earth which caused a GPS system failure… one of many. But this one was caught on a weather satellite image which you can actually see. For people who claim they didn’t FEEL the axis shift… you also DON’T FEEL the rotation of the earth which turns over 1000 MPH. Do the math for the exact speed. The earth is just over 25,000 miles in circumference at the equator. The earth does a complete rotation every 24 hours… which is over 1000 miles per hour. So why would you think you could FEEL a shift in position if you can’t feel the rotation? The earth is in space… not a bowling ball. The physics in zero gravity space on a planet orbiting the sun are quite different on inertia as a body in space than inside the gravitational field on earth. It also orbits the sun every 365 days. You don’t FEEL that either. Just because you don’t experience Sci-fi movie special effects you anticipate, does not mean it did not happen. The only time a Tsunami occurs is when the Earth Axis or crust shifts. The only other exception would be tsunamis caused by landslides, glacier chunks, volcanic eruptions which usually affect a landmass in its path of shorter distance (ie: Alaska, Iceland, Italy) than an axis shift would cause. Although a large asteroid or meteor cluster could cause a massive Tsunami. But these are rare. Tsunamis are not caused by earthquakes, although an earthquake usually accompanies a Tsunami. The earthquake in that particular case is a RESULT of the shift… NOT the CAUSE. It is comparable to walking across the room carrying a bowl of water in your hands. The more you jostle the bowl, the more the water spills out. This is how a Tsunami occurs. When the earth or a tectonic plate shifts, it jostles the water and causes a Tsunami and an earthquake. There are plenty of earthquakes of significant intensity in exact locations of previous quakes where Tsunamis occurred without doing much more than agitating the water. Japan had several aftershocks over 7 & 8 intensity at the same location without generating another Tsunami. This is because the shifting axis caused the 2011 Tsunami. Not the quake. But you can read news reports about shifts measured whenever there is a Tsunami. Remember the big Dec 2004 Tsunami which killed over 280,000 victims in Indonesia? That was a huge shift. Not all shifts cause Tsunami’s, but most do. It depends on the severity. It is like the analogy of walking with the bowl of water. The slower and more carefully you walk, the less water is slopped over the sides of the bowl. The faster or more roughly you handle or walk… the more water is spilled. That also applies to shifts of the earth. The Dec 2006 shift did not produce a Tsunami but it did misalign the earth with the GPS satellite network which was covered up with a phony flare story. You can see there is no correlation with earthquakes & Tsunamis by looking at the record of earthquakes in Japan which occurred after March 2011. The huge Tsunami & huge quake were generated by an axis shift. However, they had hundreds of aftershocks… several which were more than 8.0 and 8.5 in the very same epicenter which did not produce Tsunami’s. They even sounded the Tsunami alarms for the Japanese coastline on those instances but no Tsunami’s occurred. That’s because the earth did not shift during those aftershocks. Only the primary axis shift caused the Tsunami. Not Earthquakes. The earthquake in conjunction with the Tsunami was also caused by the shift. The aftershocks were from the subsequent instability of the fault line. There is a lot of evidence of the global axis shifts including increased quakes, increased volcanic activity, Tsunami’s, drastic changes in weather and the severity of weather, temperatures, humidity and changes in the behaviors and locations of tornadoes. The website above has collected a lot of these records to show the information to the public and provides the official, gov’t link sources where the information was obtained to provide proof of validity of the info so you can go directly to the official gov’t site and see it for yourself. It also shows how the shift is affecting our entire planet while the officials are trying to keep it quiet and attack anyone who tries to provide the info to the public. The info may be out there, but few understand how it ties together with the changes we are seeing. The chemtrails are the gov’ts efforts to modify the weather to cool the temperature increases from our axis shift. Two other posts have more details about these. There are a few scientists who tried to defy the powers that be. They were either ridiculed or left unable to obtain work in the field of sciences again. Anytime you see a scientist being attacked by other scientists or ridiculed, etc… you had better listen to what they had to say because someone went to a lot of trouble to shut them up. Just ask Bob Lazar… or the scientist who they tried to hang as a scapegoat over the anthrax mailings on at the Army Lab in Ft Deitrick because he knew which one of our corrupt gov’t officials & cabinet members were in the lab removing the bacteria which ended up the US mail… Ironically, all addressed to the leading Democrats in the Senate. Yet, the republicans were in power. Since he was the Director and had access to the security logs of which cards entered the labs and knew it was a dirty inside political action to scare the public into war; They tried to make him a scape goat. Even when he left and obtained a job at Rice university, he was dismissed after just 2 or 3 weeks from pressure by the gov’t. No University will allow their grant monies to be endangered. This was an attack from within. That also includes the 911 where Marvin Bush had just completed a security job in the World Trade Center the day before on 910. I highly recommend you stop listening to anyone who attacks other people. If someone is being attacked or ridiculed or targeted… especially after they have revealed information to the public about nefarious things like eavesdropping, or FDA whistleblowers about tainted beef or even poor Lazar who tried to tell us what was going on in Nevada. When you see these people under attack… that should tell you the victims info is extremely sensitive and the gov’t wants to shut them up. That should also show you who the gov’t paid pitbulls are. They are the ones attacking the whistleblowers. I think it is incredibly sad that the public tends to jump on the bandwagon with the pitbulls in attacking and destroying the whistleblowers. Anyone who uses the term “Conspiracy Theorist” is NO FRIEND to anyone. The public has been programmed by the media to attack their own. Now the gov’t can sit back & watch while the public attacks anyone who tries to reveal the truth. When you allow this to happen, it will hurt everyone because people will stop putting their necks on the line to tell the public what is going on behind the scenes if their only reward is to be attacked by the public they are trying to help. This is what the Gov’t wants. To shut them up. Don’t be a puppet. Learn to recognize who the bad guys really are and the victims of those attacks had something very important to tell us… which is why the attacks are so savage. The gov’t jackals dig up every piece of dirt they can find to discredit whistleblowers. Don’t be one of the pitbulls. Don’t join the pack of mad dogs attacking a whistleblower. Listen to the whistleblower and thank them for putting themselves on the line for your benefit… because they cared enough about the truth to take the chance to tell what they know. This is one of the coring machines they use to dig the tunnels between NV, CA, NM, CO, DC, TX, etc. The The finished tunnels contain high speed magnetic trains like those used by Japan. The underground roundhouse for turning & repairing trains located beneath Taos, NM is the source of the infamous Taos hum. The gov’t uses underground ultra high speed electric trains to travel in these tunnels. Probably magnetic like Japan. These are the same types of coring machines which dug the tunnels under the English Channel and Yucca Mountain & Groom Lake. In fact, this photo was taken on Nellis Range when it was coring Yucca mountain. A railway had to be built since the tunneling machine and casks of spent radioactive fuels can only be transported by rail. 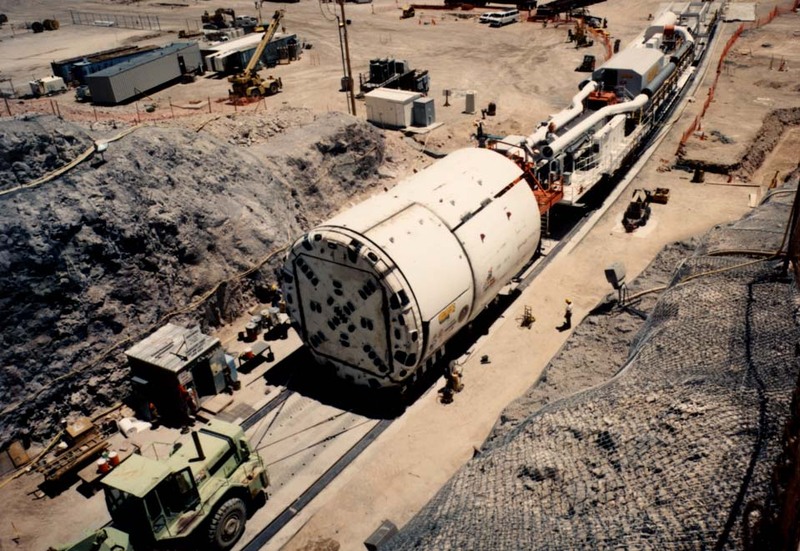 The locomotive engine in the photo, is backing the boring machine into the yucca mountain tunnel entrance while a heavy earth mover pulls with cables at the opposite end to ensure the tunneling machine remains on track. When completed, the tunnels contain ultra high speed magnetic trains like those in Japan. The underground roundhouse used to turn & repair trains is located beneath Taos, NM and is the source of the infamous Taos Hum. Since then, most tunnels are on the outskirts or under highways to avoid similar disturbances & detection by the public. Coring machine at Nellis Range, NV used to dig underground tunnel network for gov’t. Don’t be a follower of the pitbulls and gov’t jackals sent out like a pack of mad dogs to attack anyone who dares to tell the truth. These gov’t contractors & agencies swarm the internet, media, newspapers ready to attack anyone who dares to expose their dirty secrets. Think for yourself. Just look out your north facing window in June if you live north of Mexico. Not when the sun is in the sky, you have to check when the sun is rising and setting as it is in contact with a flat horizon. Mountains will skewer the results. Those who live in the southern hemisphere south of the tropic of Capricorn in mid Brazil should not see the sun setting to the south in December. You know these tropics are the furthest outermost points of the sun with a normal axis. Being tilted farther, places us farther south in the summer and farther north in the winter which affects our weather. Believe your own eyes. I need everyone in the northern hemisphere to check the position of the sun this June as close as you can to the 21st. Looking north, use a clock face as your guide. Pretend you have a giant clock laying on the ground. Looking true north (not magnetic north) on a clock face, 12 is north; 6 is south; 3 is east; 9 is west. Looking north, at sunrise when the sun is in contact with the horizon (flat ground), record which number on a clock where you see the sun. Probably about 2. Then again at Sunset as close to the 21st of June as possible, looking north, record where the sun is setting as it is in contact with the flat horizon on a clock face. It will probably be around 10 if you are in a US southern state. I am VERY interested in which states see the sun due east and west. (3 & 9). Probably around Oregon and the northern states. This will give us a better idea where the new tropic of cancer line has moved. If you can only get one side due to hilly terrain or mountains, it is better than none. To be sure you are looking at true north, use the compass on Google earth which points true north to see how your home is situated. Please add your clock face findings for the aprox locations of sunrise and sunset on June 21st 2014. Include the state where you live and the closest large town . Or the country and closest large town so I can plot the findings and get a more accurate location. It might be interesting to record the time of sunrise and sunset so we can begin to compare yearly changes. If you did not do this exactly on June 21st, please include the date you took the measurements. We will do this again in December 21st from the people who live in the southern hemisphere. Except their clock will be upside down from ours. 12 south, 6 north, 3 west, 9 east. Everything will be just the opposite on the clock but the instructions are the same except they will be looking due south. I live in South Africa in the bush and I am so glad to have found this website as I thought I was becoming crazy for noticing the sun does not rise in the east anymore as it used to, but more to the south-east. Most people when I try to talk about this just shook their heads and I can see they think I am losing it, but now I know that what I have noticed for the past about two years are in actual fact happening. I also want to add that it is happening faster than we give it credit for because within the last year the sun’s sunrise and sunset positions has shifted again even further to the south. We would very interested to know where you see the sun at sunrise & sunset when the sun touches the horizon on Dec 21st and once a week thereafter until the end of January. It is very important for us to compare your summer to ours. The sun had some very odd behavior last July & I need to see if it occurs in January on your end. But you will need the Dec 21st baseline to compare any odd conditions in January. I’m glad you showed up. We desperately need to compare your summer to ours. We had some very strange issues with the sun in July this year where it had continued to move north a month after the solstice which is unheard of. It was within 5 degrees of being directly over the north pole. Arctic circle temperatures were above 106F. I need to know if your situation shows the same oddities. Very important. This is how to check the sun on Dec 21st in the southern hemisphere. Looking toward the south, pretend you are standing at the center of a giant clock face on the ground with 12 pointing due south. Then tell us where you see the sunrise & sunset and the date. Such as sunrise 10.5 or sunset at 1.5. Also if you have time on Dec 21st at noon check the length & direction of a shadow from a plumb (straight) pole such as a 6 ft pole or sign post casting a 2 inch shadow north at noon for example. Then once per week in January. It is very important for us to know this & would be most appreciated. Noticed years ago as well. 53 year old. There are major changes in sunrise and set. No one cares really. They believe in the government infrastructure. Lol. Fools. Everyone has become desensitized and so caught up in their personal little worlds they don’t look at the big picture. Our earth is on a vengeance kick. Buckle in. Could be trippy.